How valuable is your family heritage, stored in Regular8 mm and Super8 mm films, that risk to be lost, and cannot be browsed, because your projector lamp is burned? Would you like to convert it into AVI files, and to have them on CD ROMS? Perhaps you already tried to pay some photo studio for converting the films to VHS, and you are not satisfied. And you don't want to send your film to some Telecine Service and spend several hundreds dollars? What you need is a Scanner able to acquire films, a Personal computer with a large disk, and 8mm2avi that allows acquiring the strips, converting them into frames and making AVI, using standard codecs. At the end you will enjoy the power of non linear editing: you will be able to process your home movie by a plenty of commercial, shareware, freeware software, to improve the quality, add sound and music, and, why not?, produce DVD or tapes for family amusement around the TV set. How much patience? Step 1 is of course the slowest (and the most important, the final quality will depend on it). Steps 2 and 3 can be more easily automated (they require some time, too). An example: 1 minute regular 8mm movie consists of 960 shots (16 fps), that can be acquired by 48 strips (assuming 20 frames per strip) in around 45 minutes. Converting the strips will require less than 30 minutes (this still requires sitting at the computer). Sequencing the frames is mainly a batch processing, after an initial start-up, that will last 15 more minutes. Total of 1 hour and a half, 90 times the movie duration. But, you have small investment (you use the scanner for your photos, your 35mm etc. 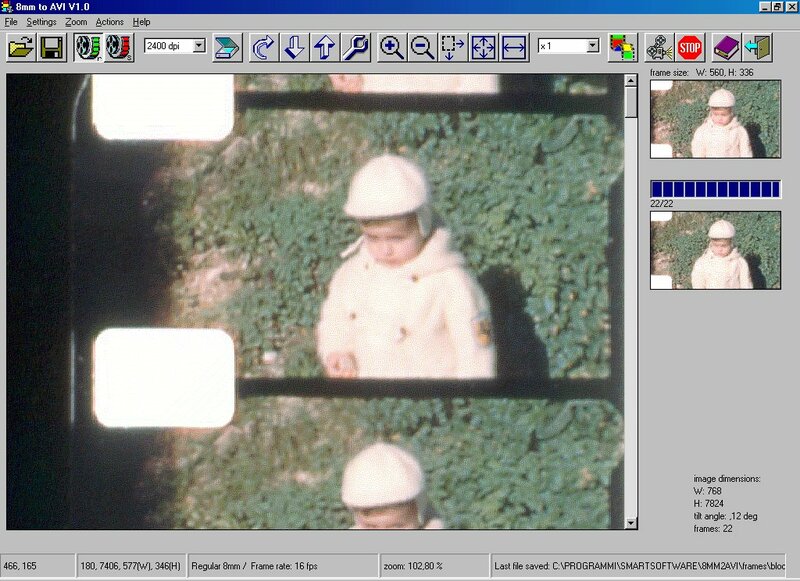 ), the quality is the theoretical best you can obtain, you have each single frame saved as a file, and you do it at home!